North Korean leader Kim Jong Un gave the order to open the line at 3:00 p.m local time (1:30 a.m. ET), according to an announcement on state media in the hours before the two phone calls to the South took place.According to South Korea's Unification Ministry, the North Koreans made first contact at exactly the time ordered, and the sides were on the phone from 3:30 p.m. to 3:50 p.m. local time (South Korea is half an hour ahead of North Korea). 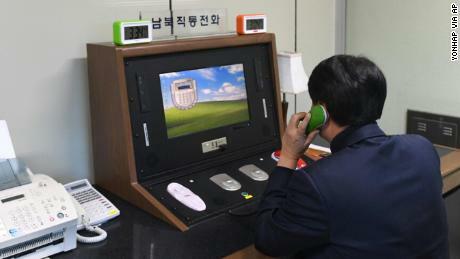 During the initial 20-minute connection, the two nations "checked technical issues of the communication line," according to a statement from South Korea's Unification Ministry.The Unification Ministry said North Korea phoned for a second time several hours later on the Panmunjom hotline, suggesting the two sides wrap up business for the day. "The North Korean side called our side at 6:07 p.m. (4.07 a.m. ET) and said 'let's call it a day today,'" the ministry confirmed. Other than checking that the link-up was operational, it is unclear what was discussed. A ministry spokeswoman told CNN that there was no mention of future talks or the Olympics. Contact had been initiated after Kim expressed hope that a North Korean delegation might participate in next month's Winter Games in Pyeongchang, South Korea.The calls came just hours after an astonishing tweet from US President Donald Trump, who again taunted the North Korean leader, this time with a boast about the size of his nuclear button. During Kim's New Year's Day address, the North Korean leader had claimed he had a nuclear button of his own on the desk of his office. "I too have a Nuclear Button, but it is a much bigger & more powerful one than his, and my Button works!" the US President tweeted. Analysis: The nuclear war tweet heard 'round the worldIt's unlikely the timing of North Korea's offer of talks was related to Trump's tweet, however. Relations between North and South Korea have warmed in recent days. During an unusually conciliatory New Year's speech, the North Korean leader extended a rare olive branch to the South, suggesting discussions about sending a North Korean team to the Winter Olympics should start "as soon as possible." In response, South Korean President Moon Jae-In called for swift measures during a Cabinet meeting Tuesday to smooth North Korea's participation in the Games.Some analysts have said that North Korea's willingness to talk to South Korea could be an attempt to drive a wedge between the US and its South Korean ally. "The South Korean government, being quite frightened about Washington's bellicosity, is quite ready to welcome the North Korean initiative, and this might lead to an annoyance in the US," said Andrei Lankov from Seoul's Kookmin University. Others argue that talks between the Koreas could be advantageous for Washington. Tong Zhao, a fellow at the Carnegie-Tsinghua Center for Global Policy in Beijing, says all forms of communication should be welcomed. "A better North-South relationship would help Washington and the international community to better understand North Korea and to talk it into taking substantive measures of self-restraint," he said. Wednesday's contact between the two Koreas marks the first time in almost two years that a special direct hotline in the border village of Panmunjom in the Demilitarized Zone has been used to connect the two countries.Until Wednesday, North Korea had not answered since February 2016 when South Korea suspended operations at the joint Kaesong Industrial Complex, a business park that once employed workers from both sides. "We have been calling North Korea twice a day at 9:00 a.m. and 4:00 p.m. but North Korea has not been responding since we had the last contact in February 2016. Nonetheless, we have been calling them every day Monday through Friday," a spokeswoman for the Unification Ministry told CNN on Tuesday. The Kaesong Industrial Complex was closed after Pyongyang launched a satellite into space, in what was widely interpreted as a front for a missile test. It followed Pyongyang's claims in January 2016 that it had successfully tested a hydrogen bomb.There's been no letup in North Korea's ambitions since; during 2017 it conducted a record number of missile launches and carried out the country's sixth nuclear test.China reiterated its support for renewed dialogue between North and South on Wednesday, and expressed its hope the US and North Korea can find a way of easing their nuclear rhetoric going forward. "China welcomes and supports both the DPRK and South Korean sides taking the Pyeongchang Winter Olympics as an opportunity to make effective efforts to improve mutual relations," Chinese Foreign Ministry spokesman Geng Shuang said. Referring to Trump's tweet, Geng added: "We hope that both parties can resume dialogue and build mutual trust as soon as possible instead of trying to be brazen and shout with each other." Moon's office welcomed Wednesday's gesture for talks and expressed optimism that they'd be extended from participation in the Winter Olympics to other issues. "The restoration of the communication channels means a lot. It is assessed that (we) are headed to setting up a structure through which contacts can be made on a regular basis," said presidential press secretary Yoon Young-chan in a statement echoed by the country's Unification Ministry.Moon has championed the 2018 Winter Olympics, set to begin February 9, as a possible means of easing tensions on the Korean Peninsula. 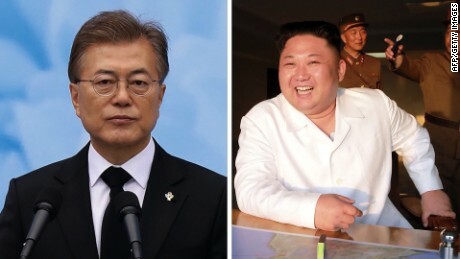 In a November interview with CNN, the South Korean leader described the Games as an opportunity for inter-Korean peace and reconciliation, and expressed his hope that the North would participate.Only two North Korean athletes have qualified for the Games — pairs figure skaters Ryom Tae-Ok and Kim Ju-sik. However, the country's National Olympic Committee did not meet an October 30 deadline to accept its spot.There has been talk of the International Olympic Committee granting an additional quota, something previously proposed by Choi Moon-soon, governor of the Gangwon province that will host the Winter Games. "If North Korean athletes can participate in the Winter Games and even parade together with their South Korean counterparts in the opening/closing ceremonies, that would send the North-South relationship to the highest level ever seen over the past few years," Tong told CNN.Daniel Pinkston, a professor of international relations at Troy University, told CNN he expected that North Korea would seek to participate in the Olympics in some capacity, "given the regime's view on sports and the opportunity the Games present for the North to deploy its soft power resources and to exploit any intel collection opportunities." Trump's hardline stance was backed by the country's Ambassador to the United Nations, who reiterated Tuesday that the US "will never accept a nuclear North Korea. "Before the calls between North and South Korea, Nikki Haley said Pyongyang needed to ban all nuclear weapons as a precondition for any talks. "We consider this to be a very reckless regime, we don't think we need a Band-Aid and we don't think we need to smile and take a picture," she said. "We think that we need to have them stop nuclear weapons and they need to stop it now. "After a year of increased missiles tests, threats and claims of nuclear capabilities, it's not clear why Kim has decided it's now time to talk. Lankov from Kookmin University says the most likely explanation is "uncertainty in Pyongyang. ""They hear strange noises emanating from the White House, and they cannot be sure whether President Trump is bluffing when he hints at his willingness to use force. So, they obviously decided to slow down, and start the charm offensive now," he said.Lankov added that while there's no suggestion North Korea is going to curb the pace of its nuclear program, the resumption of talks with the South might mitigate increasing tensions between Pyongyang and Washington. Related: 'We will never accept a nuclear North Korea' – Nikki Haley"The new developments will indeed decrease the likelihood of a war breaking in Korea as a result of the US military strike," Lankov said.Earlier this week, Euan Graham, director of the International Security Program at the Lowy Institute, told CNN that the North's offer of talks with South Korea shouldn't be taken at face value. "Up until now, they just haven't shown any interest in engaging with the South, or anyone else for that matter," he said. "But an olive branch is always wrapped in some sort of belligerent coating in North Korea, it doesn't mean the end of the nuclear program. "Even if they do reach out and send a delegation to the Pyeongchang Winter Olympics, it wouldn't surprise me at all if they accompanied that with a continuing testing program as the spring comes, be that a submarine launch or satellite launch," Graham added. CNN's Steve George contributed to this report from Hong Kong while Tim Schwarz contributed from Beijing. Will there ever be a great Harry Potter game? The evening Inbox wonders what kind of VR game Ninten..
South Korean Unification Ministry spokesman Baik Tae-hyun told reporters Friday that North Korea inf..